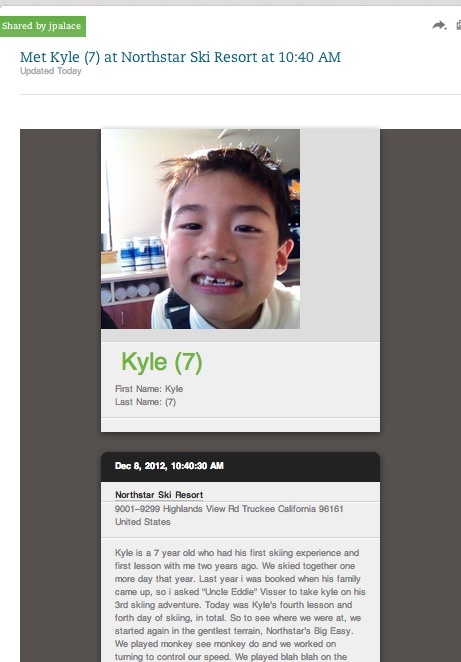 Evernote Hello makes ski lessons even better! Today's post may be most interesting to other ski instructors, but I think anyone who meets lots of people and needs help remembering them, and more importantly, the context, will love this new application I've begun using recently. Ski instructors meet lots of people, and we may see our students several times a year or far less frequently, like once a year during a family's annual ski trip. Remembering your student's name and his or her face is important, but its even better to remember how they turned, what you worked on, and what you encouraged them to practice during your lesson wrap-up. My first year as an instructor, I used pen and paper on the hill, and transcribed my chicken scratch into a lesson log on my computer at night. Sounds great, but it was easy to forget to do the computer work or lose a few notebook pages pulling the pad out of the uniform pocket, and it was time consuming! 4 years ago, I started taking photos and videos of my students and that really helped me remember them, and what we'd worked on. Parents loved seeing the videos and sharing them with grandma and grandpa as well. But there was no linkage between my pen and paper notebook, my computer lesson log, and the photos and videos I took, or last year, the EpicMix photos taken for free by the pros at Northstar. Enter the new application! Evernote Hello. These days, my student and I create a lesson summary in under 3 minutes during a hot chocolate break or on the chairlift! We take a quick photo and enter their name and an age or, with adults, we add relevant contact info. Then I can capture what we worked on and why, what the student should focus on now, and any other fun facts. After the lesson, I can still edit and add to the summary, with a simple audio note, or by typing. And, like a video or a photo, there are many ways to share the lesson summaries with my adult students or children's parents. Here's one from this past weekend. Kyle's parents gave the ok to share this on the This Mountain Life page, as long as we made sure to include only first names. I always make sure to ask before posting anything, and that's a good tip for fellow instructors as well. Enjoy, and if you have app suggestions or questions about how I use this one, do let me know.